Renew your batteries, strengthen & properly nourish your body, calm your mind and open your heart to the limitless possibilities of your existence for a fuller and more meaningful life…Welcome springtime in the majestic nature of the historic Kardamyli, at the Kalamitsi estate, just a few yards from Patrick Leigh Fermor’s house. The program includes Yoga & Pranayama in the estate’s olive grove, breakfast with organic fresh foods made with love, visits of various beaches with spring waters gushing into the sea (! ), hiking to old cobbled paths & canyons and Qi Gong with Meditation in forgotten villages with exquisite view, in the complete quietness of Mani’s olive groves! E-mail for request on transport & the great prices! Take advantage of the Kardamyli Jazz festival this wekend! 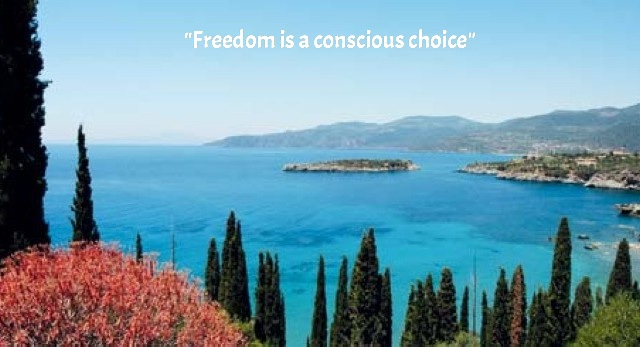 Yoga in Greece is exactly what it says… In union with all there is in the land of light (Hellas-Greece)! Our programs explore the reality of the present moment as it is manifested in the body, mind and spirit in the country that’s nested between three continents!